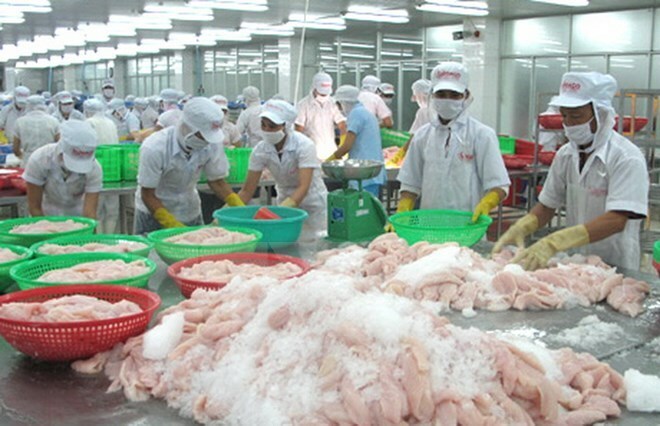 Hai Phong (VNA) – Domestic enterprises have been urged to make meticulous preparations in order to make the most of opportunities brought about by the advent of the Trans-Pacific Partnership (TPP) and the ASEAN Community. At a workshop held in the northern port city of Hai Phong on November 25, Phi Van Duc, Director of the Hai Phong Office of the Vietnam Chamber of Commerce and Industry (VCCI), said the TPP would open up new opportunities for Vietnam’s key export commodities like garments, footwear, seafood because drastic slashes of import tariffs in big markets like the United States and Japan. The TPP would help Vietnam improve its investment environment and bring in new opportunities from a new supply chain expected to be formed after the TTP takes effect, Duc said, adding that the agreement would motivate Vietnam to complete its mechanisms, including mechanisms for a market economy, thus pushing forward the reform of growth model and the restructuring of the economy. Vietnam’s economy is expected to grow faster and generate more jobs when the agreement takes effect. The TPP will also boost the quality of human resources, income and reduce poverty rate, he added. According to Duc, however, to take advantage of those new circumstances, enterprises need to make good preparations. Otherwise, those with poor competitive capacity will face bankruptcy, causing unemployment and other social consequences. Pham Chi Lan, an economic expert, mentioned opportunities offered by both TPP and ASEAN Community. According to Lan, at the formation of the ASEAN Community, Vietnam will have more opportunities to approach markets and reduce its reliance on China; encourage domestic investment and attract foreign investment; involve deeper and more effectively into the global value chains and regional and global manufacturing networks from agriculture to industry and service. Relating to the TPP, while the country’s export is expected to increase at faster pace, competition on the domestic market will grow tough with the increasing presence of foreign companies in all sections of the market.